The 2018 Preseason All-Big 12 Football Team was announced today, and three Cyclones made the list in Brian Peavy (CB), JaQuan Bailey (DE) and David Montgomery (RB). The team was chosen by media representatives who cover the league. A native of Houston, Texas, Peavy returns as one of the best cornerbacks in the nation in 2018, earning All-Big 12 recognition in each of his first three seasons at Iowa State. The preseason All-American is the active team leader in tackles (232), pass breakups (30) and interceptions (5). Peavy was a Second-Team All-Big 12 selection in 2017, leading the team in takeaways (4) and ranking third in tackles (88). He also led the team and ranked 25th nationally in fumbles recovered (2). The lockdown corner, who has 34 career starts, is the NCAA active leader in career passes defended with 35. Bailey, who hails from Jacksonville, Fla., was named Honorable Mention All-Big 12 in 2017 when he led the team with 7.0 sacks, tying for the fourth-best season effort in school history and ranking fifth in the Big 12. Bailey, who registered 34 tackles while starting all 13 games in 2017, has 10.5 career sacks and string of 20-straight starts for the Cyclones. Montgomery became the 14th player in school history to crack the 1,000-yard barrier in 2017 when he rushed for 1,146 yards. He ranked third in the Big 12 in rushing yards per game at 88.2. The Cincinnati, Ohio native was one of the toughest backs to bring down, forcing 109 missed tackles to earn First-Team All-American honors by Pro Football Focus and First-Team All-Big 12 accolades. Montgomery tallied six 100-yard rushing games and 11 TDs a year ago. 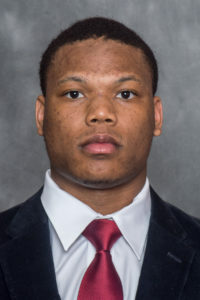 He also proved to be a threat as a pass-catcher, ranking fifth on the team in receptions with 36, the second-best season total by a Cyclone back in school history.